A limited number of pre-sale tickets will be available for the Manchester & London shows from 10.00am tomorrow. Look out for pre-gig fan social events in a PUB! hurrah! 🙂 Just working on the detail of where and when before posting these up. 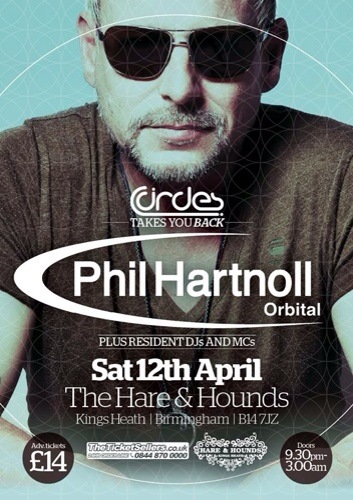 Mr Phil Hartnoll, 50% of Orbital, will be DJing at the Hare and Hounds in Birmingham, on Saturday 12th April. We had a lot of contributions over the last week and Matt kindly updated the list to make it more standardise, plus contributed a lot of dates (thanks mate). A few more arrived shortly after and we now have the latest update online. Please visit this page to see that latest and remember to contribute further if you can see gaps or bits that need detail. There is a load of comments at the bottom, where memories are flooding back. Worth a read as well. Thanks again all. 26th March – #Orbital Live Gigs Loopz Project updated – @orbitalband. Thanks to all the contributions so far. Still asking for everyone to brain dump Orbital gigs from the past and then at some point i will tidy up the page.